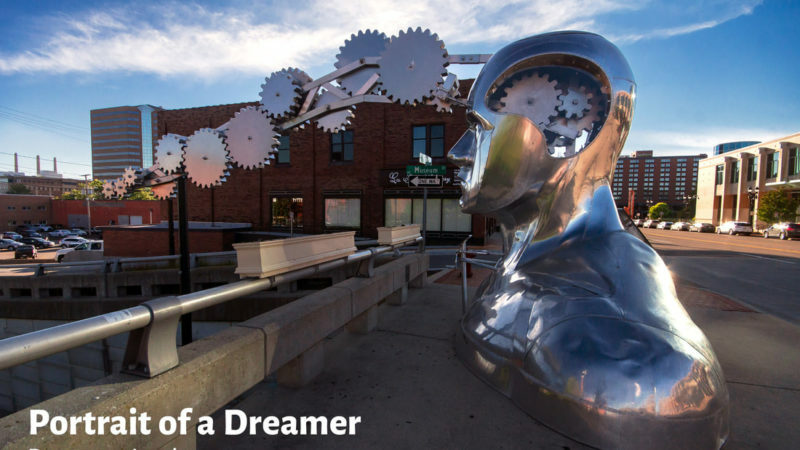 The 15-foot-tall sculpture called “Portrait of a Dreamer,” is composed entirely of stainless steel and overlooks Museum Drive from Michigan Avenue. “Portrait of a Dreamer” is not just substantial in stature but is also interactive and illuminated. Artist Ivan Iler describes the piece as one that visualizes the flow of ideas transpiring within Lansing’s cultural district, “As I designed this sculpture to represent all three organizations that are housed on Museum Drive, I thought of gears ‘turning’ and those gears/thoughts/ideas moving down toward the cultural district,” said Iler.